Kills fleas, mites and other insects on contact. Pick up clothing, toys, shoes and other obstacles that may prevent thorough treatment. Set spray nozzle to crack and crevice (jet stream) and spray cracks and crevices where carpet, title, wood or other floor material and wall meet. 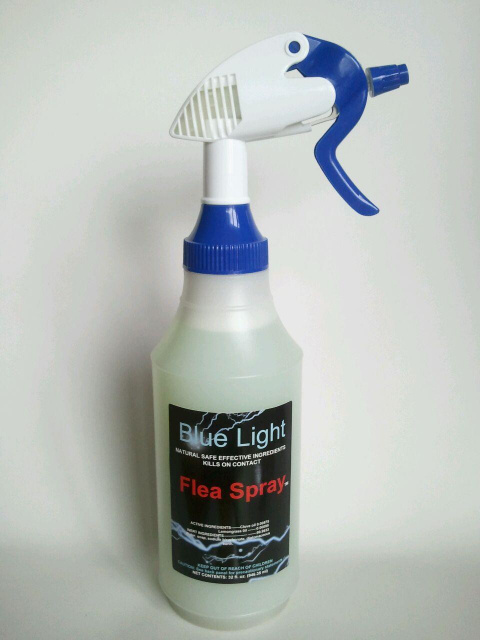 Set spray nozzle to fan-type and apply Blue Light Flea Spray to carpets, rugs, upholsteres furniture, pet beds, pet resting areas and other infested habitals. Remove couch cushions and lightly spray these areas of the couch. The (32 oz.) Ready-to-use flea spray will treat a small apartment or house of approximately 700 sq. ft.
Blue Light Flea ingredients include Clove oil, Diatomaceous earth, and other natural botanical extracts. Buy this product and do-it-yourself, or call (512) 569-4685 for licensed professional flea exterminating service in the Austin, TX. Metro area.